This year we have been even quite intentional across the whole school as we encourage on-going investigations of the properties of basic materials like sand, mud, water and ice, and to encourage children to think about changes in these and other materials over time. We’ve also been thinking about ways to make connections between our investigations indoors and outdoors. We decided to set up an area specifically for mud play outdoors. This is very basic – two big containers with garden soil are near the sandbox along with a work surface and a variety of buckets, scoops, pans and other tools. If it’s been dry, we bring water over to the space as well – otherwise we encourage children to notice the changing texture of the soil as the weather changes. Indoors we’ve made a point of using both kinetic (moldable) and fine sand in a variety of ways along with our classroom water tables. We’ve thought together about what we need to be able to mold sand, and children have enjoyed using a variety of tools to create shapes, sand castles and more. They have been interested in cutting kinetic sand into pieces, and have made the connection between all these materials and the natural clay we’ve introduced for art projects. 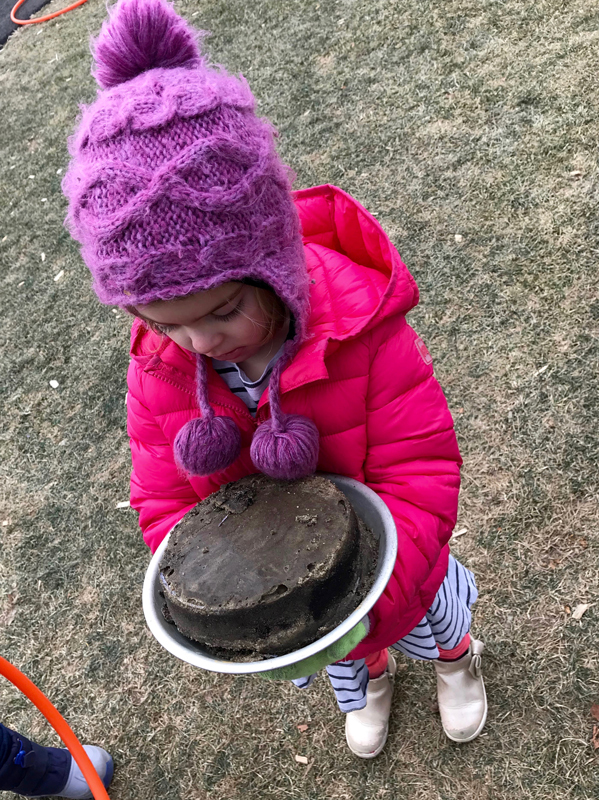 On another very cold day children excited to discover that in a bucket of ice, they could seeing mud and water moving under the ice! How could that happen? Why is it that when we try to reach the water we only feel the hard cold ice? One day a small bucket was frozen inside of a bigger bucket. Children pulled and pulled until one child pulled it out, and found he had a circular piece of ice with a hole n it where the bucket had been! Indoors there have been many ways we have investigated ice. We froze a variety of plastic animals into containers of ice and children worked to “free” the animals, concerned for their ability to get pretend food and care for their babies. We used shape molds to create 3 dimensional shapes of ice at our light tables, noticing how long it took before water was on the table too, and noticing which shapes could spin or slide best as they melted. We added liquid watercolors to the molds so that we could better see ice crystals form and other textural changes in the shapes as the ice melted, and enjoy he resulting “rainbow puddles” that formed as the ice melted. We froze paint in ice cube trays so that we could paint with ice as it melted. Outdoors, we’ve been investigating plants, including a pumpkin, over time and children have been fascinated watching the changes in texture as time passed and as the weather changed. Our pumpkin went from a hard shell, to a soft, flat one, to a frozen disc that was softer or harder depending on the weather. We are still watching as it breaks into smaller pieces. – Take 2 shapes, and pour warm water on one and cold water on the other. Would using warm water melt more of the ice than using cold? – If we left our light table on all day (instead of turning off the light when no one was using it as is our habit) would the ice melt faster from the light? All this science requires is access to some very basic materials indoors and out, time to observe, a willingness for adults to listen and then encourage further questions, and enthusiastic investigation! This entry was posted in Curriculum, Education, Play and tagged children, curriculum, learning, playground, preschool, science on January 21, 2019 by Katrina Selawsky.